By Xah Lee. Date: 2011-01-25 . Last updated: 2014-11-17 . 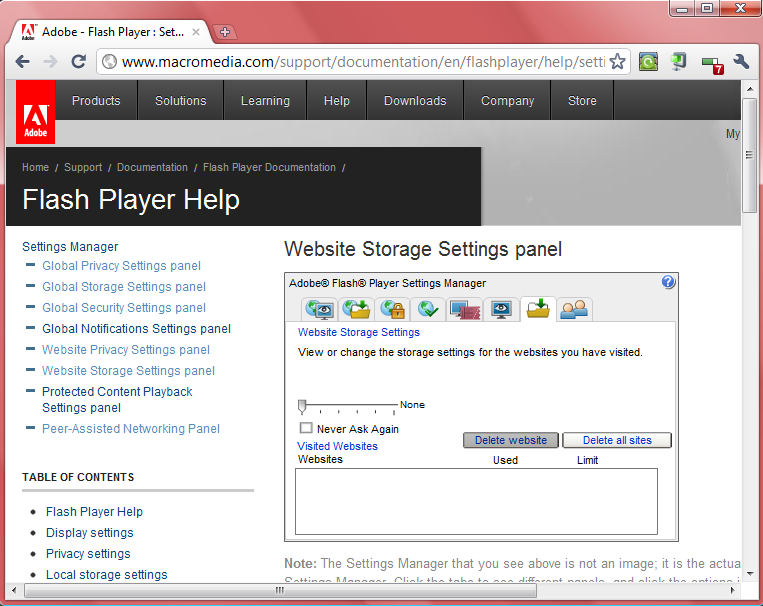 Flash is a web browser plugin that is used in almost all websites. For example, whenever you view a video on the web, or play a game in browser, ~99% of the time it is using Flash. Also, almost all online ads that shows some animation are using Flash. Even for sites that do not have any animation, they usually have invisible Flash “bug” that tracks your click behavior. What does Flash know about you? Flash cookies can track your browsing behavior, but it doesn't know your name. However, if you use social networking sites such as Facebook, it's likely many sites also know your name, address, phone number, location, and these info are stored in their data center. Bookmark that link. Whenever you want to delete Flash cookies, you have to go there. You can view and delete the local Flash cookie files on your disk. They are technically called Local Shared Objects. on Windows Vista and 7, it's at C:\Users\yourname\AppData\Roaming\Macromedia\Flash Player\#SharedObjects\. some sites won't work if you don't let them store info on your computer.